With their prices already low in exchange for massive portions, it’s hard to imagine that vegetarian discount card holders now get an additional 10% off their meal! Even if you live downtown, it’s worth making the trip to Richmond Hill/Markham for a meal out at Gourmet Vegetarian Restaurant. Our first dish, rice and mixed vegetables, may not sound like anything fancy, but the variety of mushrooms and leafy greens was excellent and the flavor was delicious. 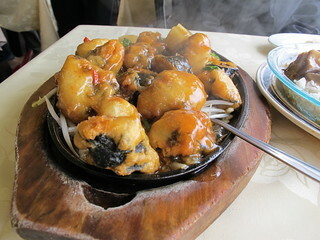 The “seafood” and bean curd on hot plate came to the table sizzling and was fantastic and unique! I always get a plate of mixed gluten when I dine here and this meal was no exception. It comes with a variety of flavours: sweet ‘n sour, curry, mock duck, BBQ and more. Some varieties are soft and gooey, while others are more chewy, but each one is mouthwatering and I can never get enough. But whatever you do, don’t miss out on the veggie lemon chicken dish! The gooey, sugary coating surrounding the soft gluten-based “chicken” will melt in your mouth and bring you back for more. Veg Status? Vegetarian but very vegan-friendly. Posted May 30, 2012 by SteveL. Filed under News from the Toronto Vegetarian Association.